Paul giving Kirsten secretarial work; Kirsten telling Paul she knows what he's doing, and she won't quit. Dan telling Libby he and her can work things out. Dan calling Carli and telling her he's looking for his wife, Samantha. Harold asking Marco and Carmella if Lou could stay with them at Number 24 after he goes. 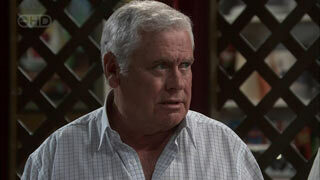 Lou is shocked that Harold asked Marco and Carmella – he's not a dog to be minded whilst Harry's away! Carmella over enthusiastically says she's happy to share number 24 with Lou, so Lou seemingly goes along with it. Karl and Susan are having brekkie at the table when Libby comes out of her room, saying that there's no movement from Zeke and Rachel's rooms. She then tells her mum and dad that Dan's married, and recounts the story of Sam leaving him because she has bi-polar disorder. Karl agrees it can really damage a marriage and says it's good that Dan cares, but Susan thinks Dan shouldn't have made himself available if he's not. Libby says that Dan's determined to make a fresh start, and Karl suggests he'll need a friend to help him through it. SUSAN: Yeah, a friend. Not a girlfriend. Dan is still trying to track down Sam when Libby comes to the door, offering a range of ‘friend' services(! ), and Dan says he's been trying to track Sam down all morning. He appreciates that Libby made him face up to things to try and find his wife. Mickey wonders why Riley isn't at breakfast so Ned tells his son that he's at a sleepover with ‘his new friend, Heather'. Lou comes over and tells the Parkers he won't be their neighbour anymore as Harry's renting the place to Carmella and Marco. He nicks some toast. 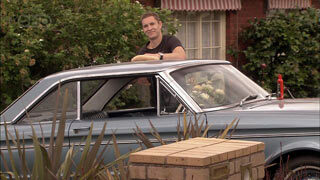 Ned says the street won't be the same without him, and Steve invites him to stay at theirs. Miranda gives Steve The Death Stare. Susan is pulling washing out of the camp bags, and Karl wonders why Zeke chats for ages on the phone to his girlfriend, but not to them. Susan tells the kids to get moving for school, before taking the washing out. Rachel asks Zeke how Taylah is, and if he has any regrets...about anything. ZEKE: This isn't the, erm, ‘protection' talk, is it? RACHEL: Well, yes. If you would like. RACHEL: Zeke! Zeke Zeke Zeke!! Kirsten is gossiping about the Chloe christening and Paul tells her he's not interested – if she's going to gossip then she can do some analysis for him instead. He'd also like her on the night desk and the early shift. She agrees, annoyed. Elle comes in with Paul's phone that he left behind. She wonders why Kirsten looked so aggrieved, and thinks it's odd that her dad promoted her for no good reason, then has started victimising her. Riley and Heather come in and Elle asks if they enjoyed their stay before disappearing off. Libby answers the door to Dan, and they agree to compare notes on the Incident Reports they're compiling. Fighting for the papers, they get a little too close. Libby says that she meant what she said before: if he and Sam can work things out that would be great. But she's not sure she can be the sort of friend he needs right now. DAN: That's okay, Libby. I don't wanna be just friends, I want more than that. Libby doesn't understand, but Dan wants to end things properly with Sam – and he thought Libby would be pleased. Libby suggests that maybe Sam has gotten her act together, now, and is alright...they could make things work out. Dan denies it – too much damage has been done. He wonders if he has it wrong about him and Libby, and she says no. But she won't get involved in a divorce – it should be about two people, not three. They settle down to the Incident Reporting. Mickey's making a welcome sign for Lou, along with his dad. STEVE: Think how good it'll be having another man around the house. MIRANDA: Oh, because I've always thought three's not quite enough. STEVE: And he can cook. MIRANDA: You know what they say about too many cooks. Ned takes Mickey out to put the notice on the front door. Miranda wonders where Lou will sleep. STEVE: Mickey can share with Riley. MIRANDA: When Riley's having grown up sleepovers? They can't agree on Lou being in the house; Miranda insists there's no room, Steve doesn't want to break a promise. Dan's friend Carli is telling him about the last time she saw Samantha; at 11am on a Monday morning, the life and soul of a party. Dan sighs. Carli admits she tried to get Sam to take her meds again, get back into a programme, but Dan tells her that Sam is addicted to being manic. Karl, Susie and Libby walk in, and see Dan and his friend. Susan suggests they go to The General Store, but Libby's happy to stay as Karl has gotten a table. They sit down and Valda brings menus – they're all staring at Dan's table! And back at that table, Dan asks Carli if she can get in touch with Sam for him. They hug goodbye, and Dan sees Libby looking in his direction. She gets up and walks over to him, and he explains that Carli saw Sam and she was still ill, still manic. Libby says she hopes he finds her, and is sympathetic. Kirsten approaches Paul with the stats that he wants, and has even made recommendations as to what to do with them. Rebecca approaches, cheerfully, so Kirsten screws up her nose and wanders away. Paul tells Becca that Kirsten is working out well, but that it's early days. Becca has come to apologise to Paul – she has to work today so can't do lunch or dinner. Libby comes in to find Dan at a table. She asks if he's heard any more about Sam, which is odd as they only saw each other two scenes ago, and nothing indicates any movement of time. But there you are. Dan tells Libby that when Sam's manic she does lots of risky stuff – men, drugs...it gets messy. Libby thinks it's a good time to reach out to her, but Dan thinks it's easier not to know about her when he can't fix it. He knows he's not responsible for her, but Libby understands that it's hard to switch your feelings off when you've been so close. She tells him he's a good person and covers his hand with hers...then realises, and says she should keep moving. Elle is trying to get Heather to understand that they don't need extreme journalism – ie, vilifying Steph over the Dance Party fiasco – to get readership, but Heather disagrees...stories need heroes and villains. Dry facts, apparently, do not make for interesting reading. She's rather vicious, is Heather. Riley thinks there's room for both catchy headlines *and* hard facts; Heather agrees, as long as they're not boring their readers' brains out. Riley orders more drinks, whilst the girls bicker at the table. Heather doesn't want Elle's feelings for Riley to cloud her judgement. Elle wants to raise journalism standards, and tells Heather to get over herself. She's on an Alpha Girl kick – but no-one cares! Elle walks off, as Riley returns. 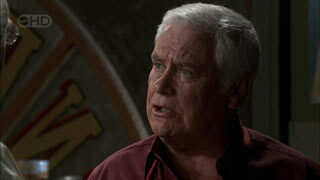 Lou tells Carmella that the Parkers have invited him to move in, and she thinks that their gain is her loss. Carmella says she has to go and see Toadie about the court case, and Harry reassures her that no court in the land wouldn't recognise her for the good mother that she is. Harry and Lou chat about him leaving, and about the very generous offer from Steve. Lou says that it will be crowded, but he has an idea! Meantime, Steve pushes Miranda into the store, with her telling her husband to tell Lou he can't move in...! Just as they approach, Lou disappears – he has to dash! Elsewhere, Rachel comes in to see Zeke, and tells him not to rush things with Taylah. She should never have gotten involved with Angus, and she underestimated what a big deal ‘it' is. So she doesn't want Zeke to do the same thing. Zeke tells her that he and Taylah weren't sure about it, and they didn't do anything – and if his big sister says anything to anyone, he'll kill her. Rachel says that for a guy, he's kinda smart. She grabs his head and places a big smacker on it. Zeke complains in disgust. Libby comes in to see Toadie, wanting a chat. Dan. He's trying to get in contact with his wife, but she can't stop thinking about it. She doesn't want to be ‘the other woman' whilst he gets divorce, but Toadie doesn't understand what the problem is: they're already separated. Plus, there's Ben. LIBBY: Wouldn't it be better if he was divorced before we got involved? TOADIE: If you're thinking about him 24/7 then you already are involved! Libby's mannerisms are so like Susan's, it's funny. LIBBY: It's too soon after Darren. TOADIE: You've got a lot of little rules, you know!! LIBBY: Can I risk it? TOADIE: The warm arms of a strong man to fall into at the end of a night. TOADIE: Someone to love you no matter what. LIBBY: Yeah. Someone to love, no matter what. (pause) I'm scared. LIBBY: ...don't call me grasshopper. Toadie tells Libby that life is way too short. TOADIE: And so are you. He's way too tall. Libby thinks about that, then looks rather pleased that Dan is a really tall man. Mmm-mmmm. Paul is at reception, whilst Kirsten explains to Ned and Mickey that she has to work. Paul answers a call from Elle, then apologises to Kirsten for being too touch on her earlier – she can go with Mickey and Ned if she likes. Kirsten says she won't use the toughness against him – she won't blackmail him (only to get her foot in the door). She's going to make him believe in her. ...he takes them to window. And in their driveway is a motorhome. Steve laughs. Miranda sort of plays along...! Dan is polishing (yes, polishing) his car. Libby comes out of number 28 in a skimpy Summer dress that would probably blow away if a large gust of wind came along. Karl is watering the roses and asks where his glamour puss daughter is off to...then turns around to see Dan and his car. Dan smiles. Libby says she's just off for a walk...and a car drives up. Out gets a blonde woman, all stilettos and suit and red nail varnish, who approaches Dan and puts a kiss right there on his lips, smack bang in front of Libby.